A small footprint and a low starting price give the Epson Expression Home XP-420 all-in-one unit a format that’s going to be desirable for those looking for basic print, copy, and scan functions. 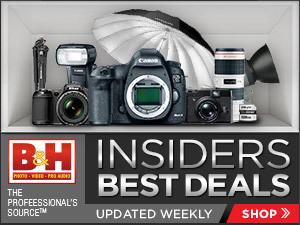 Just don’t expect print quality or print speeds that are going to amaze you. The XP-420 makes use of four different ink tanks — black, yellow, cyan, and magenta. This is a nice feature versus some low-cost printers that place three colors in a single tank, which, for example, potentially would force you to purchase a new tri-color tank because the yellow ink is exhausted, even if the cyan ink is still half full. With individual tanks for each color, you only have to purchase a new tank when a particular ink is exhausted. 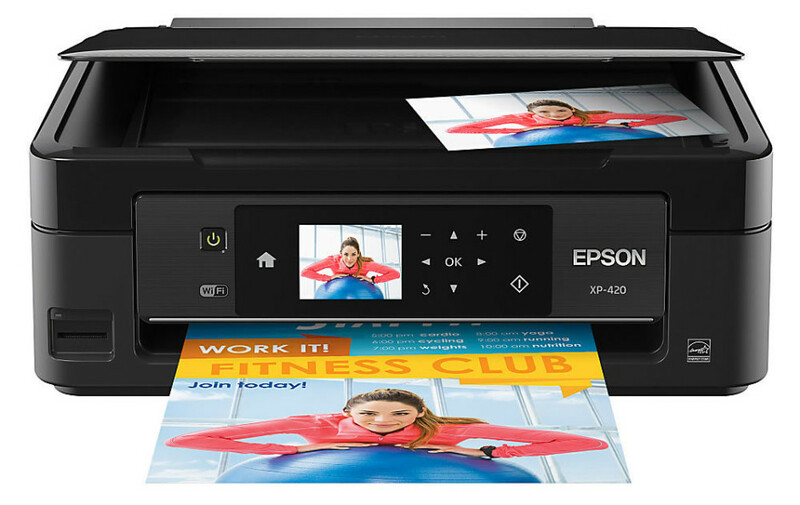 You’ll have Wi-Fi or direct USB printing options from a computer with the Epson XP-420. If your mobile device can connect to Wi-Fi and you have the right app downloaded, you can print wirelessly with this printer with tablets or smartphones. 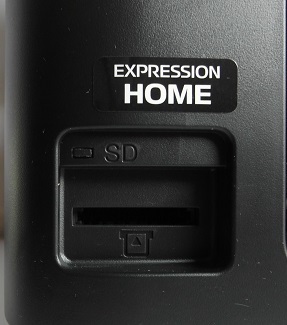 Epson gave the Expression Home XP-420 an SD-sized memory card slot, allowing for direct printing from memory cards too. The XP-420 has a small LCD screen that doesn’t have much resolution. It’s not a touch screen, but it’s helpful to see the photos on the LCD when trying to print directly from the memory card. Despite having a small area in which to provide control buttons — the all-in-one unit measures only 15.4 inches horizontally — the front panel of the Epson XP-420 is busy. The memory card slot is in the lower corner on the far left. In this close-up image of the front panel, the power button is above the Wi-Fi logo. It lights green when the XP-420 is powered on. The LCD screen measures 2.5 inches diagonally, and it is not a touch screen. To the left of the LCD screen is the Home button, through which you’ll be able to access the all-in-one unit’s on-screen menus. On the right of the LCD are the control buttons. Because the LCD is not a touch screen, you’ll use the four arrowhead buttons to move through menu selections or photo options, and you’ll use the OK button to make a selection. The plus and minus buttons allow you to determine the number of copies that will be made. The curved arrow button is the Back button. On the far right are two additional buttons, the Stop button on top (triangle in a circle icon) and the Start button below (diamond icon). These buttons have varying functions depending on the mode you’re using, and the LCD screen will give you a message when and how these buttons can be used. One really nice feature of the Epson XP-420 is the ability to tilt the front panel and control buttons up to 45 degrees, which makes it easier to see the LCD if you’re standing above the printer, which is how most people will use it. A plastic lid protects the glass flatbed on the top of the unit, which you’ll use for scanning and copying. A panel in the back of the XP-420 all-in-one pulls upward, providing a plastic guide for the paper you’ve loaded. After printing, the paper ejects out of the front of the printer, just below the control panel. 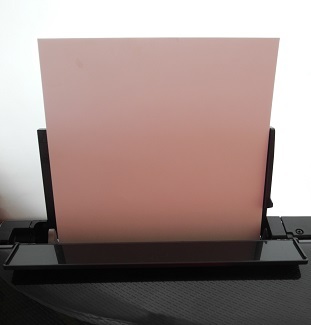 Epson’s specifications say the Expression Home XP-420 can accept 100 sheets of paper in this paper tray, but for thicker, glossy photo paper, you’ll probably be limited to 35-40 sheets at a time. The downside to having no permanent paper tray with this model is you’ll have to remove the paper each time you want to close the printer. While the XP-420 has a small footprint and only measures 5.7 inches in height when in storage, you’ll need almost 12 inches of clearance when using the vertical plastic paper guide. This all-in-one unit can accept paper in widths up to 8.5 inches. An adjustable guide can be slid inward to accommodate paper with smaller widths. Paper sized 4-by-6 inches is the smallest paper that you can use for photo printing. Try to stick with a good quality of paper when using this all-in-one printer. When I used an extremely thin weight of paper during my tests, it jammed the printer about half of the time. 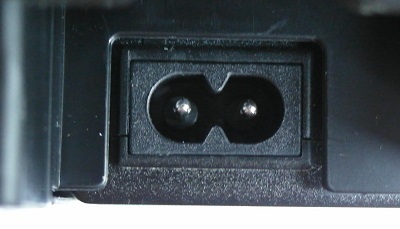 The USB 2.0 port is visible from the back of the unit on the far right. Epson did not include a USB cable with the XP-420. 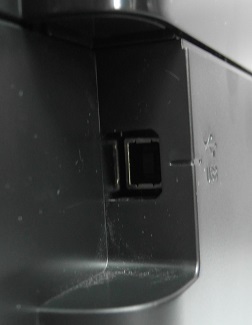 The SD-sized memory card slot is on the left side of the front panel of the printer. If you’re having problems making the XP-420 recognize your memory card, the LCD will give you some instructions. This unit does have quite a few help screens for various aspects of using its features, but none of the on-screen help features is very detailed. Once your memory card is inserted properly, you’ll see a green light to the upper left of the card’s location. You may have to hunt a little bit to find the power port on this model, as it’s along the bottom of the back panel. It’s a little tough to see unless you know exactly where to look. It’s a two-pronged port, and Epson included a 6-foot power cord. 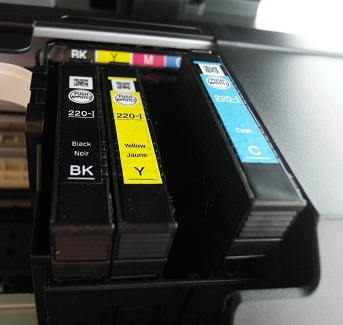 Epson uses a four-tank ink system with the Expression Home XP-420, offering black, yellow, magenta, and cyan. Each color is in its own tank. When you’re ready to install inks, open the upper portion of the XP-420. The ink tank compartment will slide into the open area, providing access for you. You’ll just slide the tank in from the top almost directly vertically downward. It’ll make a slight clicking noise as you push it into place. While there are no lights on the tanks or on the ink compartment to indicate a successful installation, the unit will run a system test after you’ve installed the tanks, alerting you on the LCD screen if there are any problems with the installation. You can check the ink levels for each tank either through the LCD’s on-screen menus or through the Epson software on your computer. You have a few options for setting up the Expression Home XP-420. To start with you can make the Wi-Fi connection directly from the unit’s LCD screen. I was able to complete this task in just a few minutes, and my Wi-Fi devices were able to connect to and print from the XP-420 without the need to install the software from the unit’s CD. You will need to enter your network password when setting up the unit on the LCD. However, if you want to install the software from the CD onto your computer, you’ll be able to set up automatic software and firmware updates, make an automatic Wi-Fi connection with the printer, and install the scan software that allows you to directly save scans from the unit to your computer. Epson didn’t include any image editing software on the CD. The process takes about 10 minutes to install all of the software. After installing the software on your computer, as you print documents and photos a popup window will appear on the screen, displaying a bit of basic information about the current print job, as well as a progress graph near the top of the popup window. 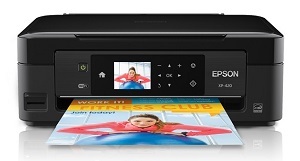 In addition to its print capabilities, the Epson Expression Home XP-420 includes scanning and copying functions. Use the glass flatbed on the top of the unit to place the documents that will be scanned or copied. You can access both the copy and scan functions from the unit’s LCD screen, as shown here. With scanning you can save the copy in a variety of locations, including to a memory card, to the cloud, or to your computer. With copying you can select the number of copies, as well as choose black and white or color copying. As the image scans, you’ll see a progress bar graph along the bottom of the screen. Once the scan is complete, the image file will be stored on your computer. You can select the folder in which to store the image file by clicking the Customize button. By default the image files were stored during my tests in the Pictures folder on my Windows 8 computer. Using the LCD screen on the XP-420 is probably the easiest and fastest way to set up the unit for use. If you choose to install the software later, it won’t interfere with the setup process that you performed on the LCD screen. As you turn on the Epson XP-420 for the first time, the setup process will begin automatically on the all-in-one unit’s LCD screen. 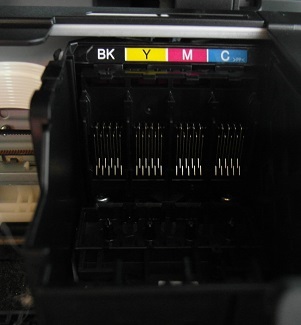 After you select your language, the printer will check for the presence of the ink cartridges, instructing you to begin the installation process if they aren’t already inserted. After the ink cartridges are installed, you’ll see the main menu screen, which contains a variety of icons from which you can change the settings on the XP-420. Use the right and left arrowhead buttons to the right of the LCD screen to scroll through the icons and press OK with the desired setting highlighted to see your options for making changes. Press the Home button to return to these menu screens from any other screen. If you choose to set up Wi-Fi via the LCD screen on the unit, it will automatically search for any Wi-Fi networks in the area. Select the one you want to use, and then enter your password. The XP-420 made the connection very easily and quickly with my Wi-Fi network with no problems. Unfortunately, the XP-420 includes many of the drawbacks that you’d expect to find in such an inexpensive and small model. The print quality is below average in quite a few situations, and this model works very slowly compared to higher-priced printers. You certainly can create good-looking photo prints at sizes up to the standard 8-by-10 inches, as long as you’re using good-quality photo paper that has some thickness to it and as long as you’re printing at the highest quality settings. Any other quality settings or the use of low-grade paper will yield well below average print quality. Text print quality was good at the highest-quality settings with good paper weight too. Paper quality is important with this unit; when I used some low-quality paper with the XP-420 during my tests, I ended up with paper jams about half the time. Draft quality prints of either photos or text documents are very poor with this model. Even standard quality prints are not very good. When printing at standard quality on non-photo paper, I ended up with thin white lines in the prints (banding), where the ink didn’t cover the entire print. It consistently produced poor-quality prints at standard settings on plain paper. Even when making standard-quality prints on glossy photo paper, I saw some banding in the print. Even though the banding was less pronounced with the higher-quality paper in standard quality print mode, it still was very noticeable. Text document print quality also isn’t good at draft or standard quality settings. As you can see, even the copy functions don’t run particularly fast with this model, unless you’re coping text documents where only black ink is required. The copy quality was good with the black text documents, but when copying a document with some color on it, my tests showed many times the colors weren’t as accurate as they should be. I was pretty impressed with the scan options Epson included with this model. You can scan to a variety of locations, including to a memory card or directly back to your Wi-Fi connected computer. The Epson XP-420’s scan options were very easy to set up and use. In fact all aspects of this model were easy to use. You can set up and run the XP-420 exclusively from the model’s LCD screen, including setting up Wi-Fi, or you can run the included software CD on your computer and make the connection to the all-in-one unit from there. Printing from a memory card is pretty easy with the XP-420 too, although you will have to work through a series of on-screen menus if you want to control any aspects of the print job. If you just print directly from the memory card at the default settings — such as if you want to make a quick print — you’ll end up with a print that is expanded or contracted to fit the size of paper you’re using, which means the quality could be poor. Because Epson chose not to give this model a touch screen LCD, it’s a bit of a hassle to work through the menus. The buttons on the unit are difficult to press accurately, as sometimes you have to press the button a few times to get a response, and sometimes when you are trying to press the button once, it will react as if you pressed it a few times. It’ll probably be easier for you to print directly from your computer, as it’s easier to make changes to the print settings on the computer screen. Still, even with a handful of problems for this printer, it’s worth considering because of its extremely low price and small footprint. This is a lightweight printer at 9 pounds, and it only measures a little over 15 inches in width. In fact it’s so small that Epson has trademarked the term Small-in-One to use with this all-in-one unit. It won’t take up much room wherever you choose to store it, although it will need a bit of extra room to extend the plastic paper guides, both for the paper input and the paper output. 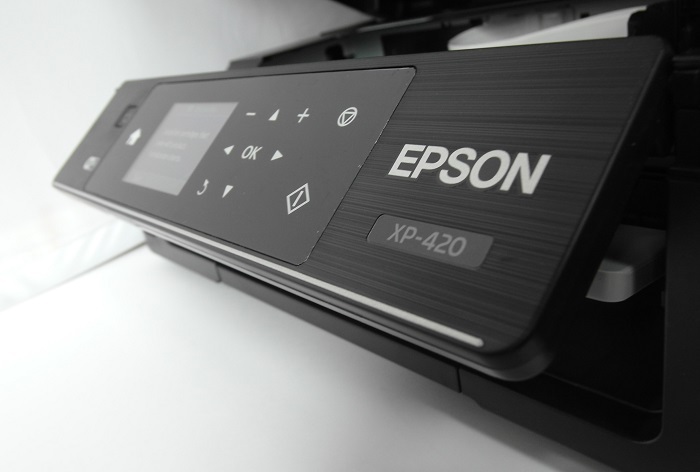 If you need a small printer for the dorm room or just for use at home in a small office, the low price of the Epson Expression Home XP-420 will make it worth considering. Just be certain that you’re aware of this all-in-one unit’s drawbacks and that you are willing to spend a little extra to use high-quality paper with it. You’ll also need to be prepared for long print times to achieve usable quality, which will be frustrating if you aren’t ready for it. If you want the highest print quality for large sized photography prints, this model won’t provide it. But it works pretty well for the entry-level all-in-one audience at which it’s aimed, as long as you understand the drawbacks you’ll encounter. 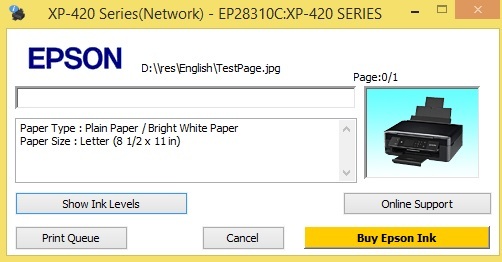 Those looking for an inexpensive back-to-school printer will want to take a look at the Epson Expression Home XP-420 ... just don't look too closely at its print quality unless the settings for this unit are just right. Unless you're printing on high-quality paper and at the best print quality setting, the XP-420's results won't be of a passable quality. At least this model is easy to set up and use, and it doesn't take up much room on a desk. The unit's copy and scan capabilities are useful, especially the scan functions. You can print directly from a variety of mobile devices too. If you're willing to accept slow performance so you can achieve acceptable-quality prints, the XP-420's price is certainly right. It has a few too many operational drawbacks for me to recommend it highly, but it's tough to argue with its price. I do sticky paper,but it won’t print cling paper..
Can i print only in black & white if i dont have color ink or do i need black ink & multi colors to print? From the window that pops up choose Printer from the bar at the top. Select “Use Printer Online” from the drop-down menu.